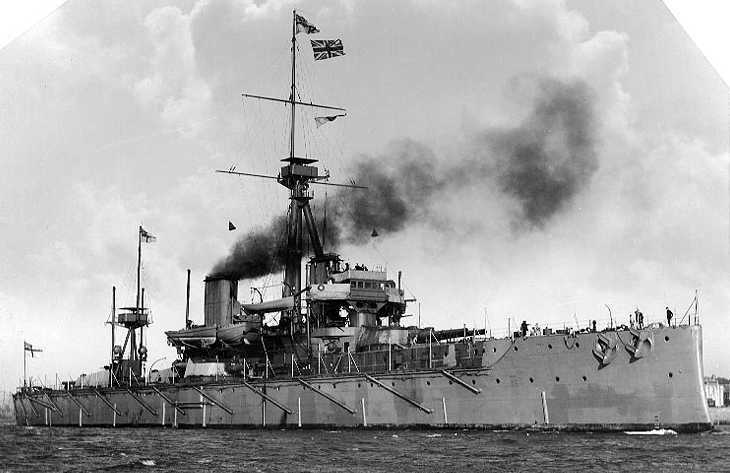 HMS Dreadnought about 1906-1907. Note that the foremast was located behind the forward stack, a position that often caused the spotting platform to be nearly uninhabitable from funnel gasses. U.S. Naval Historical Center Photograph # NH 63367. A Vickers design used on the famous British battleship HMS Dreadnought, which was the first battleship completed with an "all big gun" main armament. These guns were originally developed for the two ships of the Lord Nelson class, the last of the British pre-dreadnoughts. 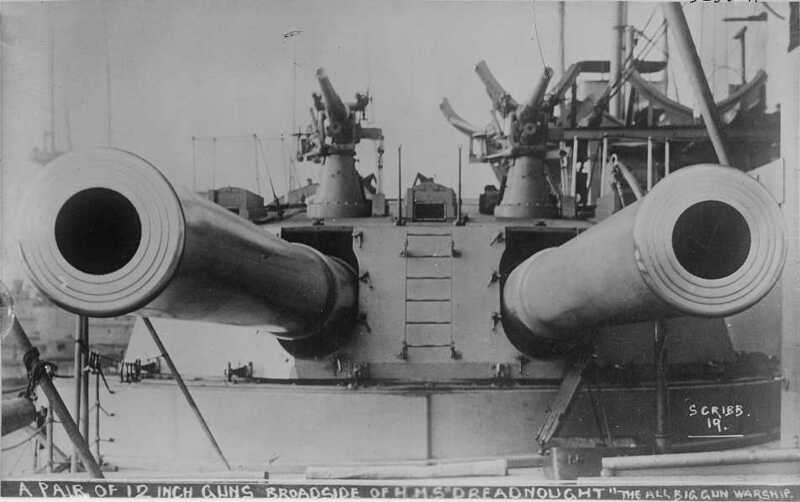 The mountings and guns intended for those ships were instead used to speed the construction of HMS Dreadnought. As a result, construction on the Lord Nelson class was held up while new guns and mountings were built for them, delaying their completion until 1908. Thus, these last British "pre-dreadnoughts" were actually finished two years after their design had been obsoleted by HMS Dreadnought. 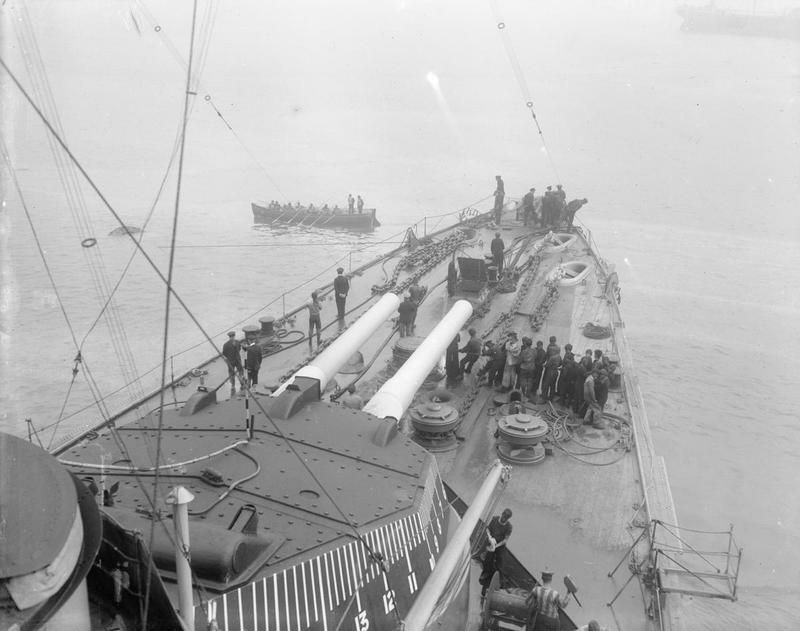 In addition to their use on capital ships, a further three guns with four spares were mounted as coastal artillery in Belgium during World War I. Constructed of nickel-steel inner A and A tubes, full length wire, B tube and overlapping jacket. The breech bush screwed into the A tube and then were both shrunk and screwed on to collars on the latter. These guns used a mechanically improved breech mechanism of "pure couple" design that was either manually or hydraulically worked. This proved so successful that it was essentially copied in all later designs. 133 Mark X guns were manufactured plus two Mark X* guns, which was to an earlier design with a thinner chase and weighed 448 lbs. (203 kg) less. ^Projectile weights from ADM 186/169. The sources below disagree as to muzzle velocity, propellant charge weights and maximum ranges. I have chosen to use those values given in "Jutland: An Analysis of the Fighting." ^Originally, 4crh projectiles were issued only to the Bellerophon and Indefatigable classes while the others used 2crh. 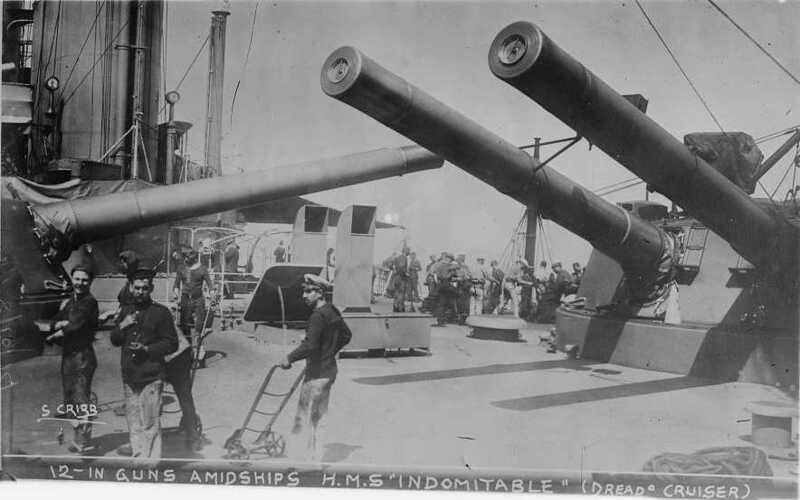 In 1915-16, 4crh were issued to Dreadnought and to the Invincible class. "Greenboys" were issued starting in 1918. ^3.13.2AP Cap weights were 34.75 lbs. (15.7 kg) for the Mark VIa and 99 lbs. (44.9 kg) for the Mark VIIa. ^This is the peacetime outfit which consisted of 24 APC, 40 CP and 16 HE all of which were 2crh. APC and CP were black powder filled while HE was lyddite filled. When the war started the outfit was increased to 110 rounds per gun in most ships. At the time when 4crh projectiles were issued to the Invincible class, the outfit was 33 APC, which were lyddite and black powder filled, 38 CPC and 39 HE. This outfit changed by mid-1916 to 44 APC, 33 CPC and 33 HE. A few shrapnel rounds were carried during the war at various times. The final outfit for the Invincible class after the war was 77 APC, which were shellite filled, and 33 CPC. The Indefatigable class carried a peacetime outfit of 24 APC, 28 CPC, 28 HE and 6 shrapnel. The initial war outfit was 33 APC, 38 CPC and 39 HE, later changed to be the same as the Invincible class. The Bellerophon class upon completion carried 24 APC, 40 CPC and 16 HE, which were lyddite filled, per gun. The data in this last table is from the mathematical study "Unyielding Air: Aerodynamic Drag and Long Range Gunnery" by P.G. Pugh. As such, it may not accurately reflect the actual performance of these guns. It should also be noted that the performance given for elevations of 20.7 and 40.1 degrees would apply only to weapons used as coastal artillery. This data is from "British Battleships of World War Two" for an uncapped AP shell striking a plate at 90 degrees, i.e., with the axis of the shell perpendicular to the face of the plate. A capped shell would show about 10 to 20% improvement at low velocities and about 30 to 50% improvement at high velocities. Data from "British Battleships: 1860 - 1950" and may reflect the performance of an APC projectile. DNO Rear-Admiral A.G.H.W. Moore summarized Ordnance Board remarks regarding armor penetration in a "Memorandum to the Controller" dated 24 October 1910. In this Memorandum it was stated that 12 inch (30.5 cm) APC shells striking at any angle over 20 degrees were unlikely to penetrate even 4 inches (10.2 cm) of KC armor (face hardened) and were likely to breakup at angles of 30 degrees when striking 6 inches (15.2 cm) of KC armor. Thus, it can be seen that the poor performance of British shells at Jutland (Skagerrak) cannot have been a surprise to the Royal Navy. Remarkably, the memo does not suggest that the shells be improved, but instead urges that these thicknesses of armor be considered for future ship designs, as if it was expected that enemy shells would perform as poorly as did their own. "From the trials with AP shell with cap so far carried out by the Ordnance Board against KC armour, it is clear that when striking at angles greater than 20deg to the normal there is very little chance of any AP shell in the service carrying its burster through such armour at any fighting range, as the shell would break up in passing through the armour. Generally speaking[,] capped AP shell, even when filled with salt, may be expected to beak up when striking KC armour of half caliber thickness at 30deg to the normal. ^The BVIII* mountings on the Indefatigable class differed in that the gunshields were of modified shape and structure in an effort to improve protection. The BIX and BX mountings on Invincible were interesting in that they were electrically powered by 200 Vdc from four 200 kW steam generators and 100 kW oil motor/generators within the ship. These mountings proved unsatisfactory and were constantly breaking down during their active service life. As a result, they were converted to all hydraulic power prior to the start of World War I. ^These mountings were reworked during World War I to increase their maximum elevations to +16 degrees, a rather costly operation for the small increase in range thus achieved, which was less than 1,600 yards (1,460 m) at new gun velocities. ^The Invincible class had staggered amidships mountings intended to allow them to shoot across the ship as well as directly forward and directly aft. However, gunnery trials showed that the blast damage from such firings was unacceptable and the actual firing arcs were restricted to approximately the figures given above. At the Falklands battle, Invincible fired cross-deck with both P and Q turret but this dazed and deafened the gun-layers, trainers and sight setters as well as causing blast damage to the deck. P turret reported that the trainers had to be replaced constantly during the battle as they were too dazed to function properly. After the battle, cross-deck firing was ruled out except in cases of emergency. ^The amidships mountings on the Indefatigable class were more widely separated than the Invincible class in an effort to improve cross-deck firing, but it was again found that this overstressed the deck and supporting framework. These mountings differed from earlier ones in that projectiles and propellants were rammed directly from the main hoisting cage into the gunloading cage without tipping out into an intermediate position. This made for a simpler transfer but slowed the loading cycle as the main cage could not descend until the transfer had taken place. Surviving battlecruisers had 1" (2.54 cm) armor plates added to their turret roofs following Jutland (Skagerrak). Battle experience showed that British turrets in general were inadequately protected, especially on these early 12" (30.5 cm) models. Problems included the lack of gunport shields, which meant that splinters and blast could easily penetrate into the working areas. There were also large gaps between the base of the gunhouse and the top of the barbette, leaving an area of reduced protection. The sighting ports on top of the turrets were of an open design, which allowed both gunsmoke and sea spray to enter into the gunhouse as well as causing considerable discomfit to the crewmembers whose job it was to peer through these ports at the target. These sighting ports and the turret rangefinders also projected up above the turret roof, which unintentionally turned them into deadly shell traps. Finally, the sloping front roof of these turrets meant that the angle of incidence for incoming shells was less than that for a flat roof, which increased the chance of a penetrating hit. The Lord Nelson class had a total of eight main and seconday turrets all closely grouped on the upper deck. It was felt to be impractical to fit mechanical stops to prevent interference between the mounts, so instead a system of rubbing contacts were installed on the revolving trunks and hoists. These sounded loud buzzers when the turret was pointed such that it could cause damage to the other turrets or to the superstructure. These proved so successful that they were incorporated in all later ships. "A" turret on HMS Dreadnought. 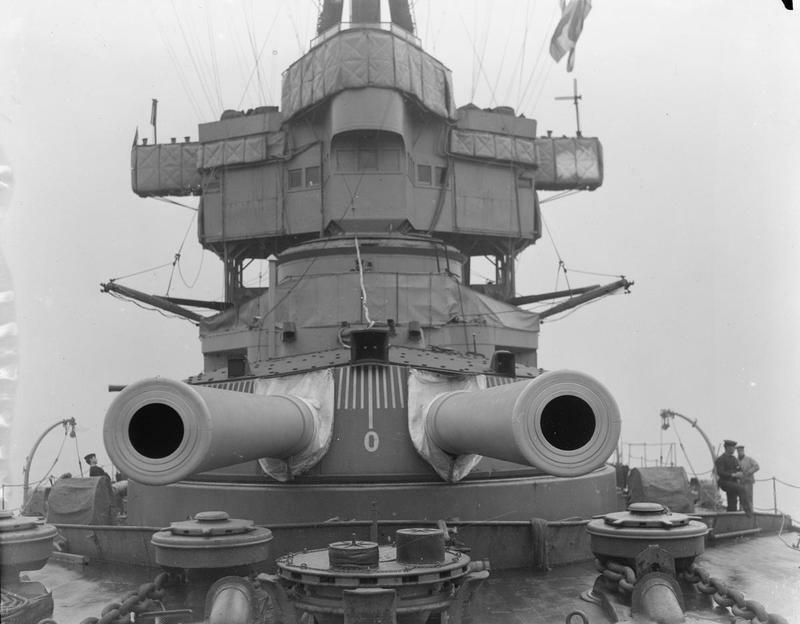 Note large gunport openings, sighting hoods, lack of gunshields and 12-pdr 18cwt guns atop the turret. These were all seen as weaknesses in the protection of these turrets. The small brackets around the gunport are for attaching bloomers. Bain News Service Photograph as Library of Congress Photograph ID LC-DIG-ggbain-17494. HMS Indomitable circa 1910. Note the bloomers covering the gunports. Bain News Service Photograph as Library of Congress Photograph ID LC-DIG-ggbain-16724. Bow Turret of HMAS Australia in 1918. Note the Declination Marks, sighting hoods and the built-up nature of the gun barrels. IWM Photograph Q18740. 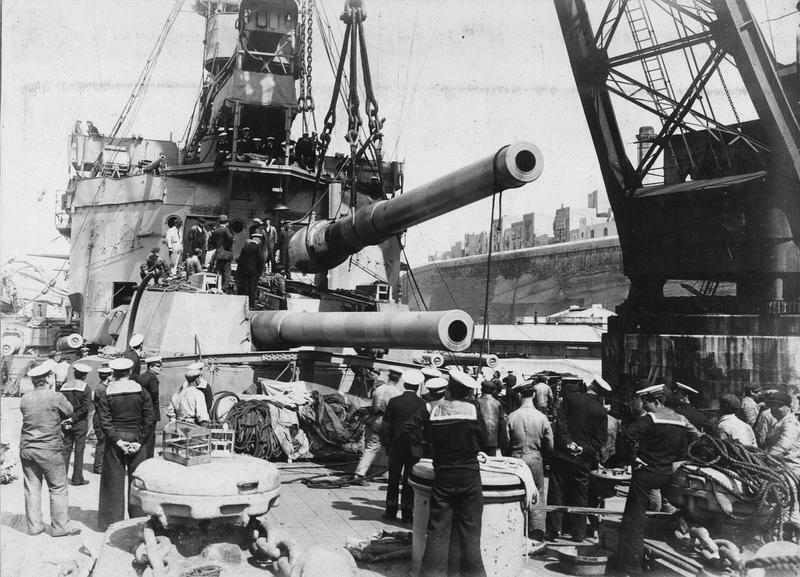 Another view of the same turret on HMAS Australia in 1917. Note the armor plates on the turret top which were added following the Jutland (Skagerrak) battle. IWM Photograph Q18717. Bow turret of HMS Agamemnon. This photograph may show her being disarmed as part of her post-war conversion to a radio-controlled target ship. Note the 9.2"(23.4 cm) turrets on left and right. Up in the superstructure can be seen 12-pdr [3"/50 (7.62 cm)] 18cwt QF Mark I guns. IWM Photograph HU 129425. 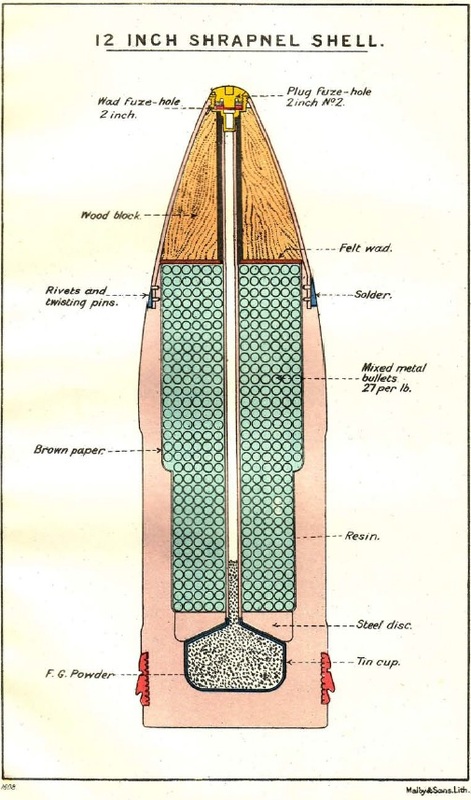 12" (30.5 cm) Shrapnel projectile. Sketch from O.U. 5267. "Unyielding Air: Aerodynamic drag and Long Range Gunnery" article by P.G. Pugh in "Warship Volume X"